This special section was created for the Charlotte Observer. The marketing department usually handled special sections, but they were too swamped to take on this project at the time, so guess who to the rescue! Naturally, there were caveats. The cover needed to be in full color and she had artwork which she wanted to use. It was a piece of clip art, from Microsoft Word, therefore it wasn’t the right resolution. In other words, it would be blurry if we tried to print it. Besides, I thought it important to tie the puzzle theme throughout the piece. After a bit of arm-twisting (gently, of course), I convinced her to use the image you see above. I did have to take it into Illustrator, use some puzzle piece art as a clipping path, and separate it in two. The rest of the cover was made in Quark XPress. Once the client saw what I had come up with, she was thrilled. The other caveat was that the project needed to be completed quickly. The director was new to her position, so all the elements hadn’t been brought together in time for the deadline which the marketing department had set. The entire eight page section needed to be completed in just under two weeks. Child’s play for Koger Creative! The inside pages were created in Quark XPress. As you can tell, even without seeing the entirety of each page, there was quite a lot of formatting. Each page had puzzle pieces with images of children and their families sprinkled throughout, along with pull quotes in puzzle pieces, too. Pull quotes are quotations or bits of text from an article which are set off from the body copy. They are usually set in a larger font and often highlighted with art or some special effect. In this case, the pull quotes were set tightly in Gill Sans (bold and italic) inside the puzzle pieces. During the final revisions, the client actually sat with me as tweaked the copy and images to fit just right. The client was very pleased with the final product and wrote a nice letter to the Observer management stating how easily the project had gone from start to finish. The campaign was a success, too. 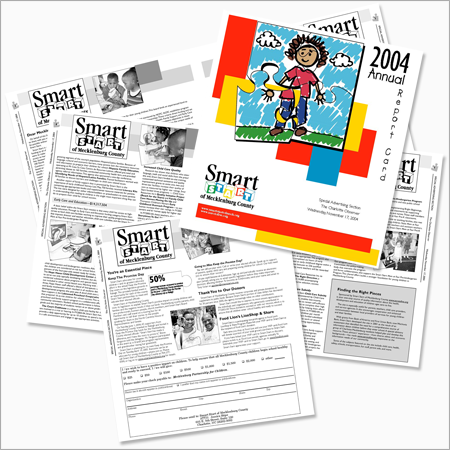 Smart Start had a very good response to the section and contributions exceeded the previous year! This entry was posted in featured by Keith Koger. Bookmark the permalink. Thanks for posting this! I didn’t get a chance to meet you when you were working on this project since I came in 2006, but I forwarded your article to my executive director. Please let us know what you have been up to! Glad you liked the post! The Smart Start special section was a fun piece which I thoroughly enjoyed working on. And your organization was a pleasure to work with, too! If you ever want to collaborate again, please contact me.